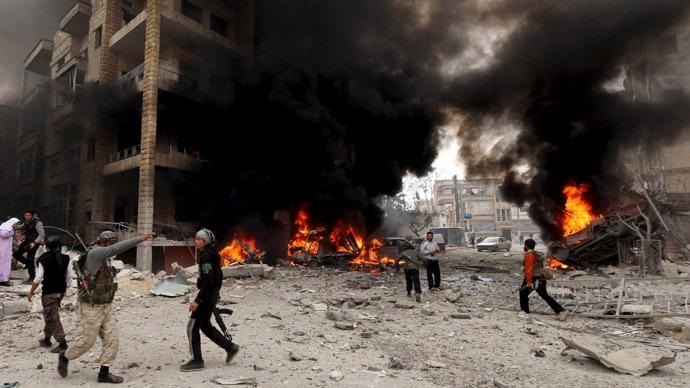 JNN 03 May 2015 Damascus : US-led airstrikes have killed 52 Syrian civilians in one day, a monitoring group reports. There was fighting in the vicinity, but the strike allegedly failed to kill even a single Islamist fighter. “Airstrikes by the coalition early on Friday on the village of Birmahle in Aleppo province killed 52 civilians,” the head of the Syrian Observatory for Human Rights Rami Abdel Rahman told AFP. “But Birmahle is only civilians, with no [ISIS] positions and no clashes,” Abdel Rahman continued, although raids were carried out on a nearby town, where seven militants were killed. This entry was posted in Jafria, Middle East and tagged Abdel Rahman, Civiilians, Islamic State, Rami Abdel Rahman, Syria, Syrian civilians, Syrian Observatory for Human Rights, syrian president, syrian president bashar assad, Syrian Rebels, US Airstrikes. Bookmark the permalink.